Brodie Waters is proving over and over again he has what it takes to get to the top in motorcycle racing. 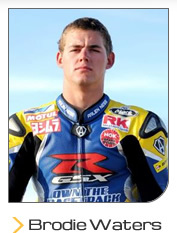 2012 has seen Brodie take his talent, enthusiasm, passion and dedication and use it all to emerge as a professional motorcycle racer ready to meet the new challenges that lie ahead. At just 20 years of age he has already had 7 years in the professional paddock. He has raced everything from an 80cc dirt bike to a Superbike and stripped and rebuilt almost every bike in between. His last 2 years with the factory backed Team Suzuki road racing squad has given Brodie the experience of operating in a dedicated professional team and fine tuned his vision to win and be a champion. In the last 3 years Brodie has raced Supersport, Superbike, Prostock, Endurance and some dirt track just for fun and on every occasion has given his full dedication to the job. Brodie came second in the Australian Supersport Championship in 2011 and came heart breakingly close to winning the championship in 2012. 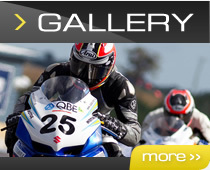 Brodie Waters has teamed with Yoshi Miyajiwa to win the famous Suzuka 4 hour race for the Moriwaki Racing Team. Copyright 2019© Brodie Waters. All Rights Reserved.